A regent (from the Latin regens, "[one] ruling") is "a person appointed to administer a state because the monarch is a minor, is absent or is incapacitated." The rule of a regent or regents is called a regency. A regent or regency council may be formed ad hoc or in accordance with a constitutional rule. "Regent" is sometimes a formal title. If the regent is holding his position due to his position in the line of succession, the compound term prince regent is often used; if the regent of a minor is his mother, she is often referred to as "queen regent". Famous regency periods include that of the Prince Regent, later George IV of the United Kingdom, giving rise to many terms such as Regency era and Regency architecture. Strictly this period lasted from 1811 to 1820, when his father George III was insane, though when used as a period label it generally covers a wider period. Philippe II, Duke of Orléans was Regent of France from the death of Louis XIV in 1715 until Louis XV came of age in 1723; this is also used as a period label for many aspects of French history, as "Régence" in French, again tending to cover a rather wider period than the actual regency. As of 1 December 2016, Lichtenstein (under Alois, Hereditary Prince of Liechtenstein) is the only country with an active regency. The term regent may refer to positions lower than the ruler of a country. The term may be used in the governance of organisations, typically as an equivalent of "director", and held by all members of a governing board rather than just the equivalent of the chief executive. Some university managers in North America are called regents and a management board for a college or university may be titled the "Board of Regents". The term "regent" is also used for members of governing bodies of institutions such as the national banks of France and Belgium. In the Dutch Republic, the members of the ruling class, not formally hereditary but forming a de facto patrician class, were informally known collectively as regenten (the Dutch plural for regent) because they typically held positions as "regent" on the boards of town councils, as well as charitable and civic institutions. 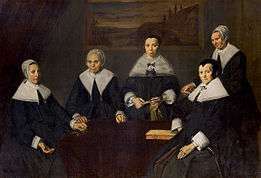 The regents group portrait, regentenstuk or regentessenstuk for female boards in Dutch, literally "regents' piece", is a group portrait of the board of trustees, called regents or regentesses, of a charitable organization or guild. This type of group portrait was popular in Dutch Golden Age painting during the 17th century, and in the 18th century. In the Dutch East Indies, a regent was a native prince allowed to rule de facto colonized 'state' as a regentschap (see that term). Consequently, in the successor state of Indonesia, the term regent is used in English to mean a bupati (local government official). Again in Belgium and France, (Régent in French, or in Dutch) Regent is the official title of a teacher in a lower secondary school (junior high school), who does not require a college degree but is trained in a specialized école normale (normal school). In the Philippines, specifically, the University of Santo Tomas, the Father Regent, who must be a Dominican priest and is often also a teacher, serves as the institution's spiritual head. They also form the Council of Regents that serves as the highest administrative council of the university. ↑ Harper, Douglas. "regency". Online Etymology Dictionary. Retrieved 2014-08-18. "early 15c., "government by regents," from Medieval Latin regentia, from Latin regens (see regent). Notable instances were: France 1715-1723 (under Philip, Duke of Orleans), Britain 1811-1820 (under George, Prince of Wales, Prince Regent)..."
↑ Harper, Douglas. "regent". Online Etymology Dictionary. Retrieved 2014-08-18. ""one who rules during the minority or absence of a sovereign," c.1400, from the adjective (now archaic, attested in English late 14c. ), from Old French regent and directly from Medieval Latin regentem (nominative regens), from Latin regens "ruler, governor," noun use of present participle of regere "to rule, direct"..."